These maps were produced from an ensemble (group) of 12 global climate models supplied by the Pacific Climate Impacts Consortium. These maps are called ‘delta’ maps (delta means change). They are produced by first finding average climate condition for a specific month in the future and then subtracting the average values for that same month in the past. In other words, these maps show the difference between current climate conditions and projected, future climate conditions. We used two 30-year future periods (2021-2050 and 2051-2080). Our “current” period was set to 1976-2005. The daily climate model data we used was statistically generated from monthly General Circulation Model outputs. 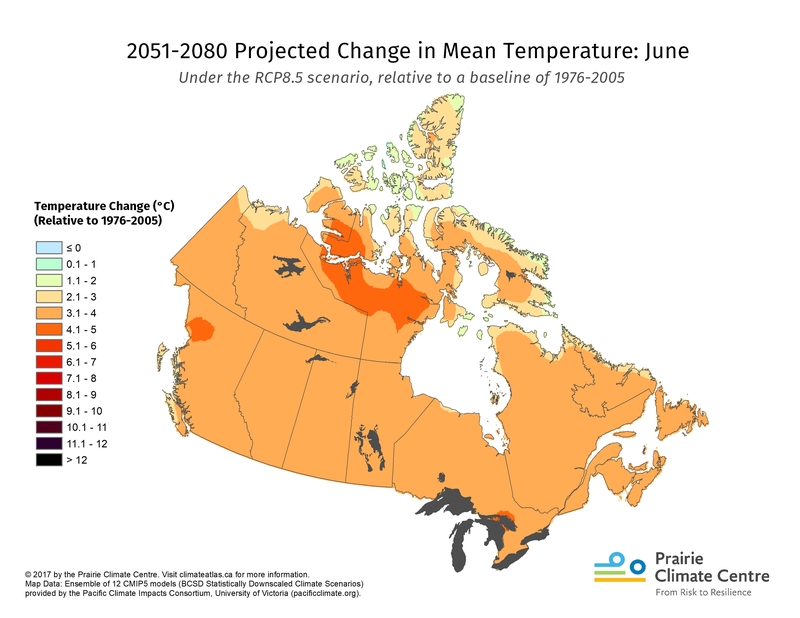 As such, there are some limitations on how this data can be used and interpreted. Precipitation is much more difficult to model than temperature. 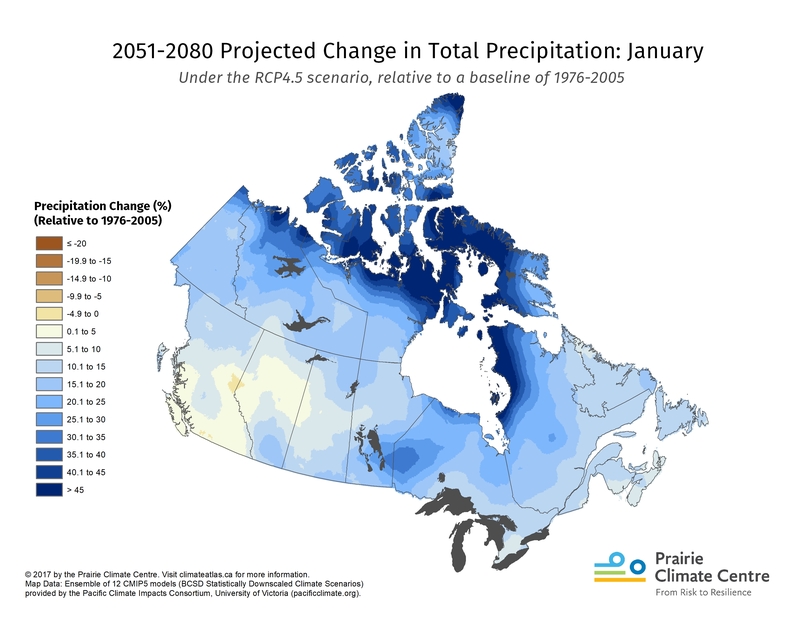 The range of possible extreme precipitation events are (in many cases) much higher in real-life than in the modelled data. 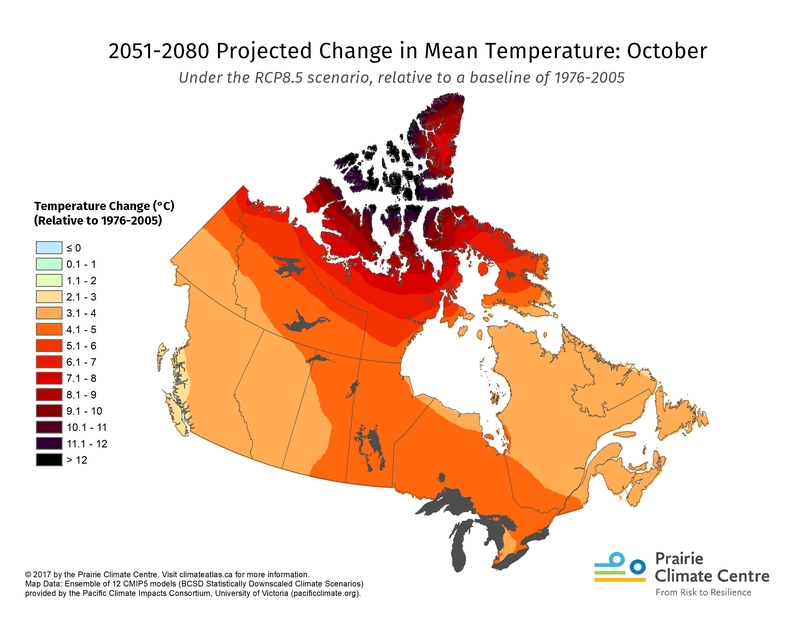 To address this problem we rely on using an ensemble of 30-year averages, which should approximate this natural variability. In meteorology, the mean temperature reflects the average of all temperature measurements made in a day (typically the average of 24 hourly measurements). Because we only had access to the daily max and daily min temperatures, we defined (as is very common in climatological research) mean temperature as the average of the daily max and daily min temperature. 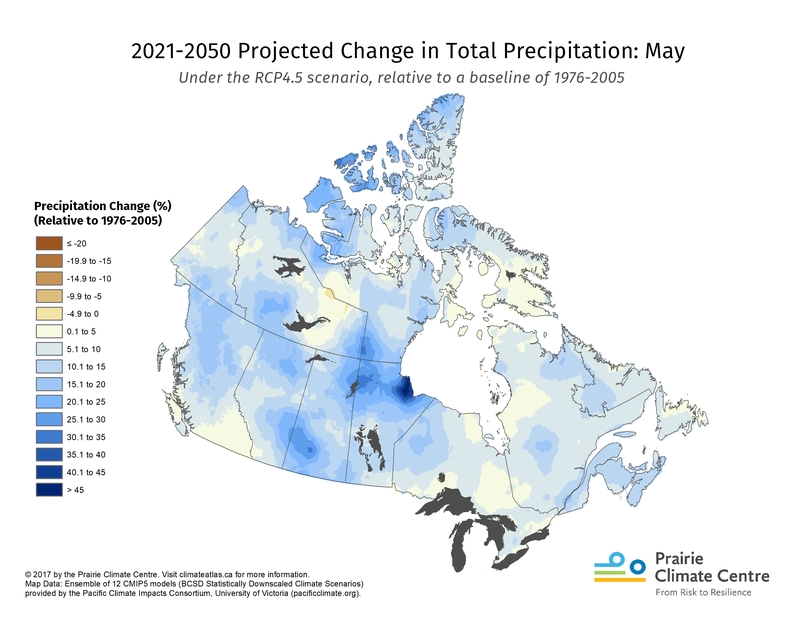 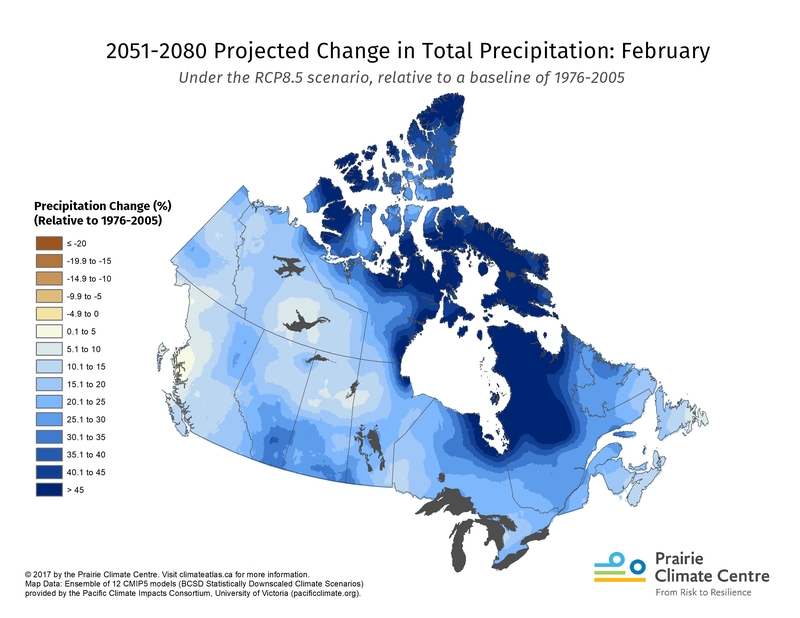 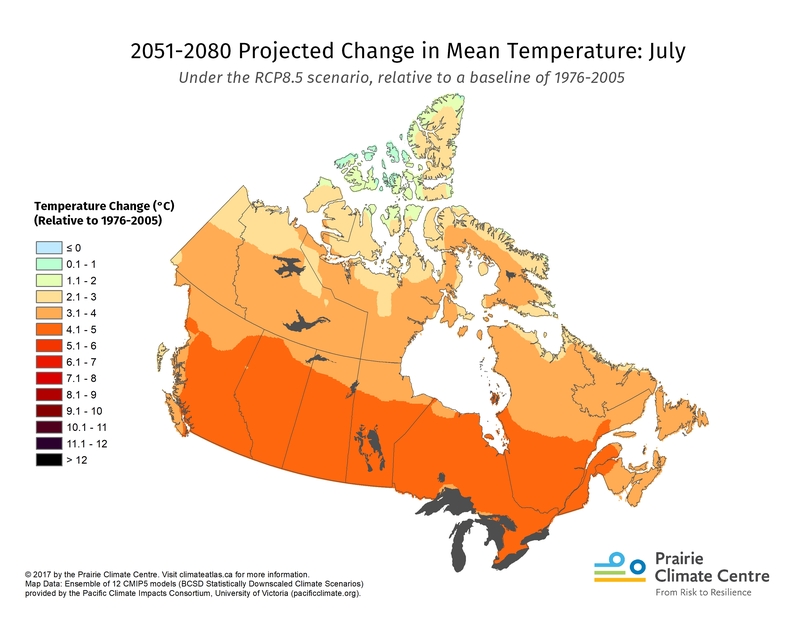 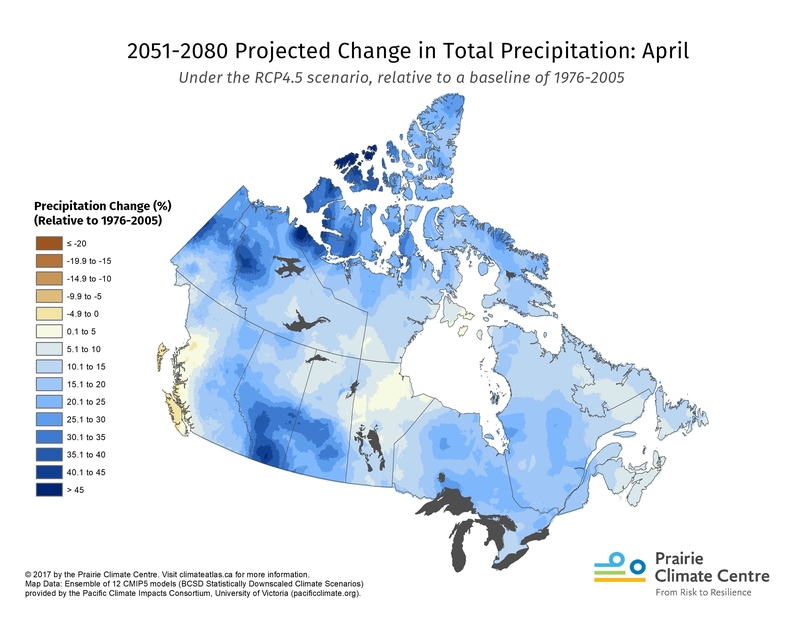 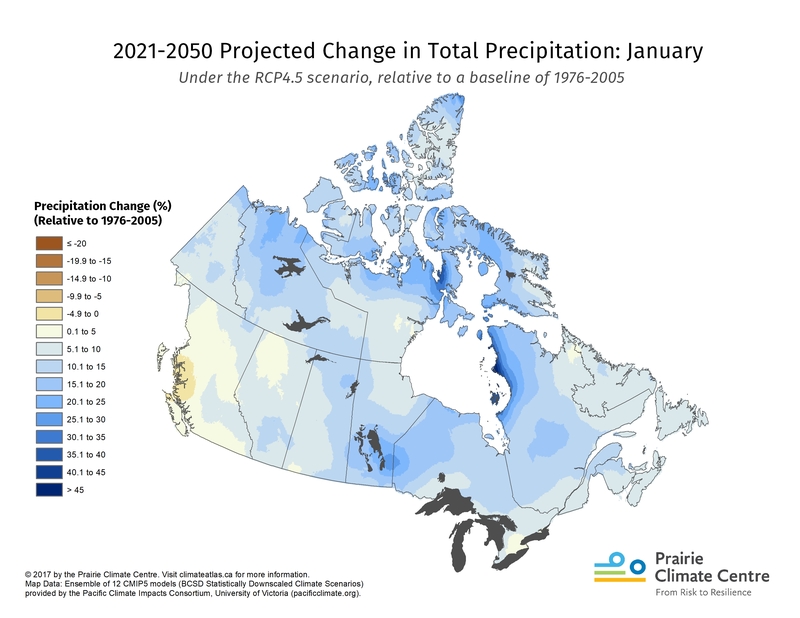 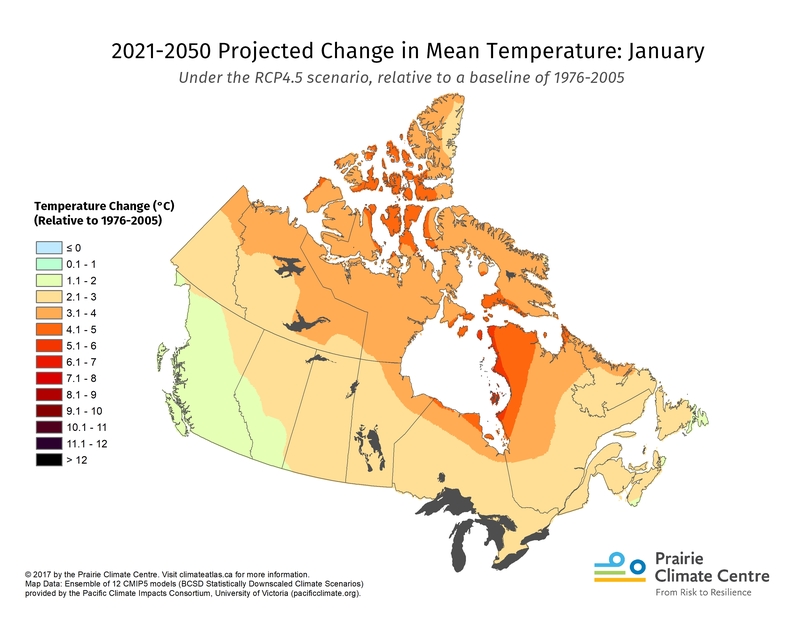 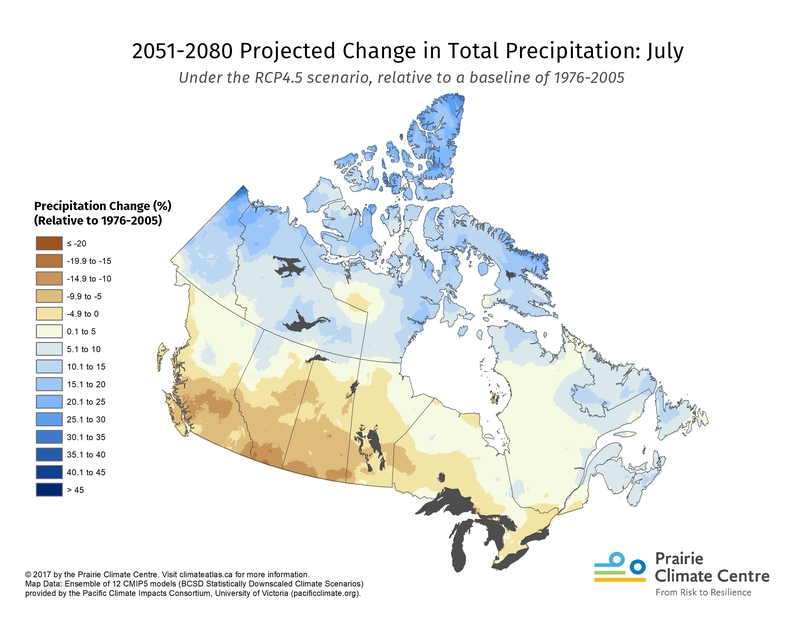 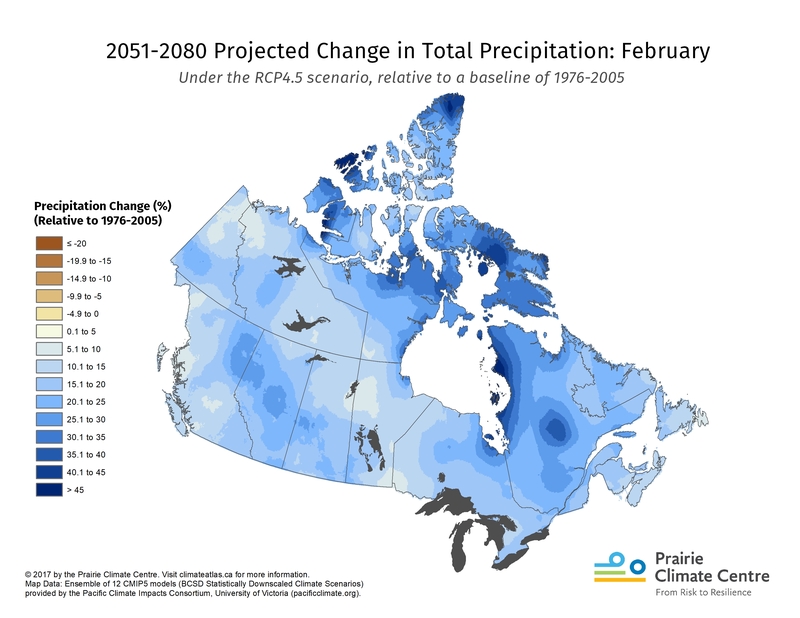 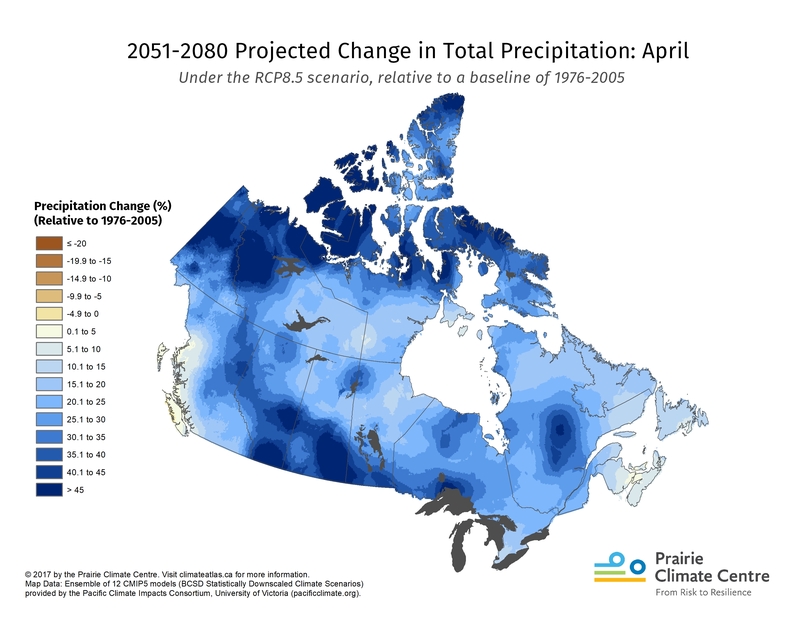 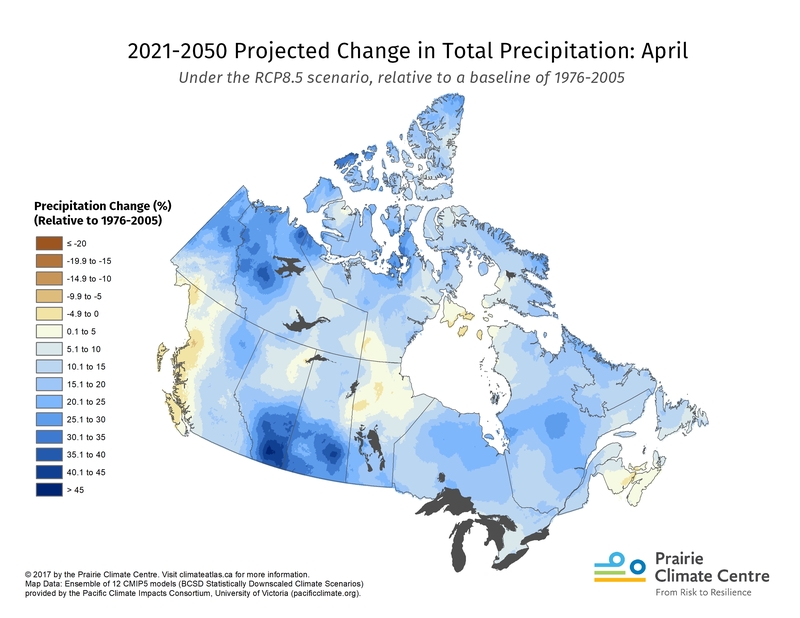 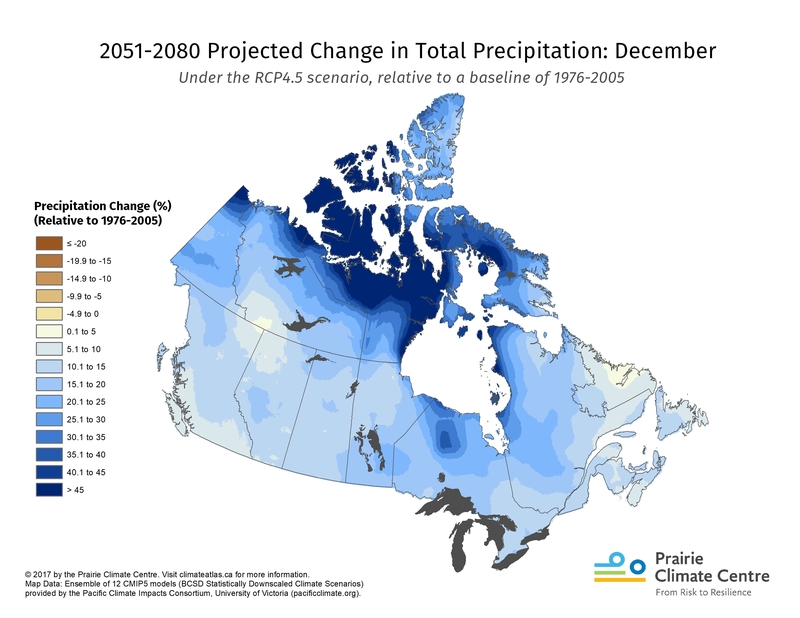 The climate model data is downscaled to a 10 km by 10km grid by statistically meshing the climate model data through a set of modeled and interpolated observed data produced by Natural Resources Canada (NRCan). Any errors or misrepresentations in the NRCan gridded dataset, therefore, are transferred to the downscaled climate model data. 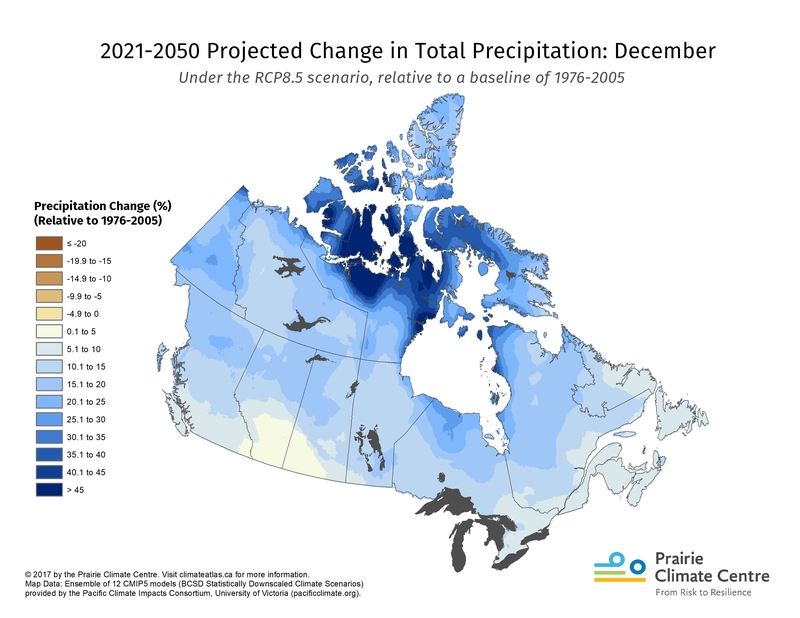 Misrepresentations in the interpolated historical data are possible when i) there are temporal gaps in the raw weather station data; ii) there are large geographic distances between weather stations; iii) there are mountains present; or iv) there are large contrasts in microclimate inside of a 10km by 10km region. In short, the climate model data we use is most prone to error over mountainous regions, rural regions across all of Canada, and all northern Canada.